J.H. Bufford – What Exit? Visitors to our new website may recognize the image in the top right corner as the yellowed pencil sketch in our recent exhibit Rutgers through the Centuries. Nothing is known about the artist C.C. Abeel, but we do know the original lithograph on which his drawing is based: J.H. 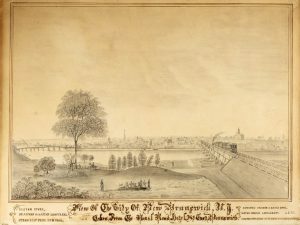 Bufford’s View of the City of New Brunswick, N.J. taken from the Rail Road Hotel at East Brunswick. The lithograph, which can be found in our Pictorial Collection, was published about 1838 with a helpful list of the sites depicted. In this blog post we will have a closer look. The Railroad Hotel was established shortly after the opening of the railroad from Jersey City to New Brunswick by the New Jersey Railroad and Transportation Company in 1836. The line ended at the terminus on the eastern bank of the Raritan River in what was known as East Brunswick (now Highland Park). Passengers to New Brunswick had to go down steep stairs from the tracks and take a carriage across the Albany Street bridge. 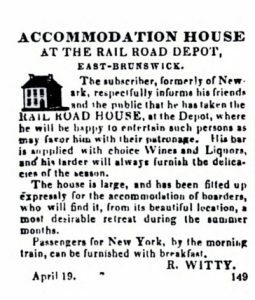 Some passengers, however, went to the Railroad hotel instead, advertised as “a most desirable retreat during the summer months” for its “beautiful location” (right). 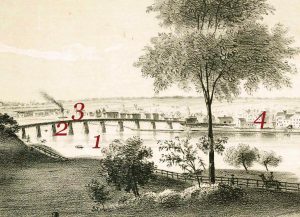 It was from this hotel that the young artist and lithographer John Henry Bufford (1810-1870) drew his View of New Brunswick shortly after the building of the railroad bridge, which put an end to the East Brunswick terminus. 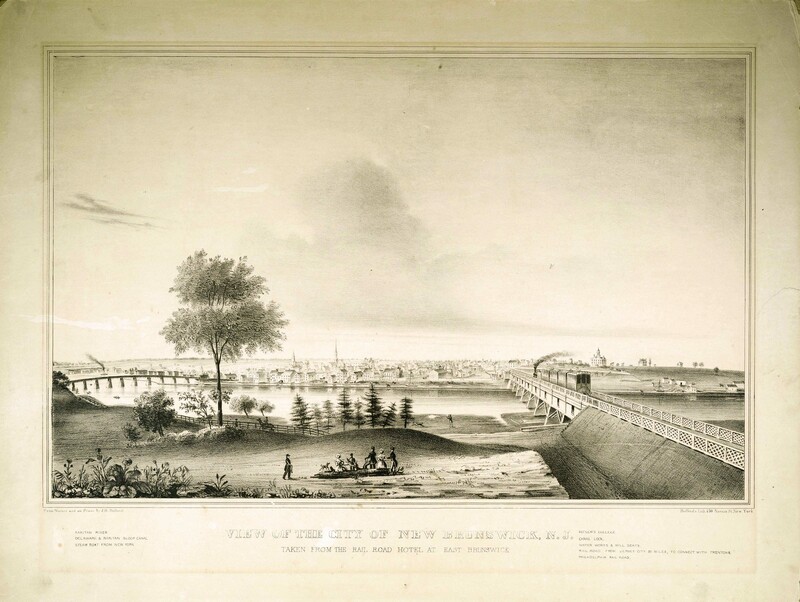 As Jeanne Kolva and Joanne Pisciotta describe in Highland Park: Borough of Homes the new two-tier railroad bridge, which carried pedestrians, carriages and wagons on its lower level, caused competition for the old Albany Street bridge. The wooden toll bridge, built in 1794 (#2 on the left), was left to deteriorate and was ultimately demolished in 1848. Parallel to the Raritan (#1) on the New Brunswick side of the river was the newly dug Delaware & Raritan Canal or, in Bufford’s words, “Sloop Canal” (#4). One of the major engineering feats of the era, it was created between 1830 and 1834 for three million dollars, dug by immigrants, mainly by hand. Canal boats carrying freight were towed by mules along the canal, but in Bufford’s lithograph there are only one-masted sailboats (sloops). To complete the picture of New Brunswick as a transportation hub, Bufford drew a steamboat from New York, one of the many managed by Cornelius Vanderbilt or one of his competitors (#3). 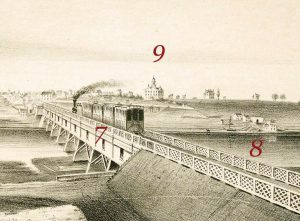 The new bridge, built in 1838, was the first railroad bridge across the Raritan river. Bufford’s depiction of the lower tier (#7) makes the noise and darkness experienced by passengers and horses easy to imagine. To the north of the new railway bridge was the canal lock that allowed boats to move from the upper to the lower level of the Raritan & Delaware Canal at New Brunswick. Bufford drew the canal lock as well as structures that he listed as “Water Works & Mill seats” (#8). Maps of New Brunswick from our Map Collection shed light on what Bufford depicted. 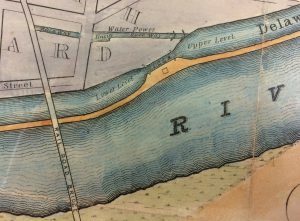 While a map of 1837 only displays the water power plant behind the lock, a later map reveals an adjoining saw mill and paper and cotton factory. In the distance Bufford drew Rutgers College, founded as “Queens College” in 1766 (#9). The first cornerstone of the building, presently known as “Old Queens,” was laid in 1809 but it was only expanded to its present size in 1825 after financial support was received from various sources, including the philanthropist Henry Rutgers, who also donated the college’s bell. As described in Views and Viewmakers of Urban America businesses greatly benefited from the portrayal of their cities as bustling centers of industry, commerce, and progress. In stark contrast with the novelties of the canal, railroad, and bridge is the tranquility of the scene at the front. 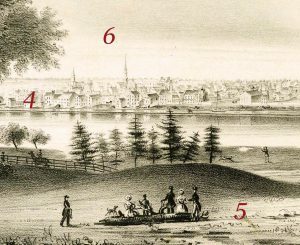 Seated on a tree trunk is a company of wanderers (5), admiring the view, which includes the sloops on the canal (#4) and the spires of the Dutch Reformed Church (6, left) and Christ Episcopal Church (6, right). On the left is a horse rider following the path along the river; on the right we see a man and a dog, hunting birds. They all look like they will soon have refreshments at the Railroad Hotel. With thanks to Al King, Manuscripts Curator.